EFF and People For the American Way have joined forces to launch Stop The Spying, a website that encourages people to use photos and videos to ask Congress to oppose telecom immunity and help stop companies from working with the NSA to spy on internet traffic and telephone conversations. Don’t just tell Congress to stop the spying — show them. Countless citizens have told Congress to reject telecom immunity, but the Senate is still threatening to pass a bill giving immunity to lawbreaking phone companies. It’s time to get creative and move beyond words. Let’s show our elected representatives who supports the rule of law — ordinary Americans from across the country. 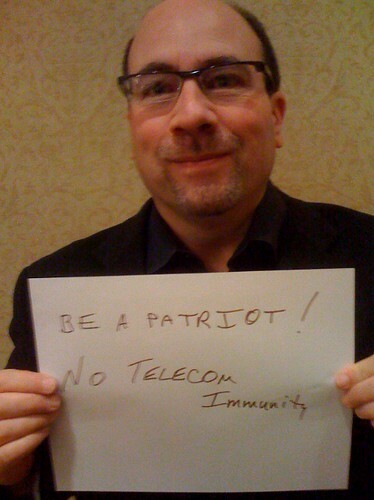 We’ll deliver your multimedia messages to lawmakers to drive the point home: no immunity for lawbreaking telecoms! For more background info, see EFF’s article on “The Case Against Retroactive Amnesty for Telecoms” regarding the case were AT&T gave the NSA access to their facility San Francisco so they could monitor customer communications.